Happy Friday! It's been a busy week so I'm thankful it's the weekend! I'm already thinking about weekend brunch and nothing starts off a lazy weekend like a tall mimosa. Instead of the usual orange juice and champagne version, I found a recipe with a slight spin. Blood Orange Mimosas captures everything we love about regular mimosa but with a slight flavor and color of ripe berries, perfect for summer! 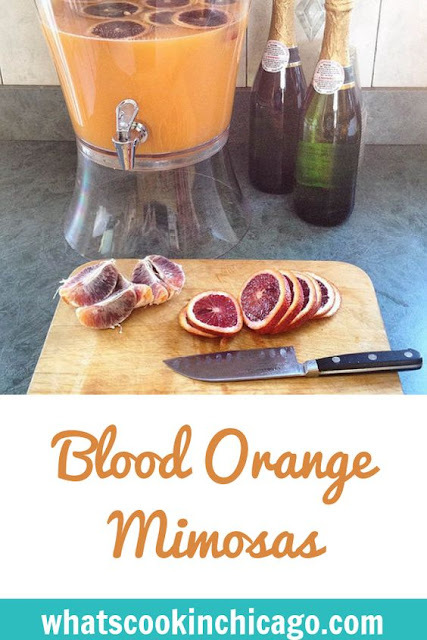 Blood oranges are great to use for their sweeter citrus flavor and hint of berries. I especially love their bold color. They usually are in season between December and May, but every now and then I come across them even into June. If you can find them. try them the next time instead of regular oranges. Another change is the use of prosecco for the light effervescence. True champagne can be costly so for a more affordable option, reach for prosecco! The recipe below doubles and triples easily - which you may want to do off the bat - and are great for brunch parties too! Combine the fresh blood orange juice, regular orange juice, sugar and Grand Marnier in a pitcher, stir to combine.Transfer to the refrigerator and chill completely. 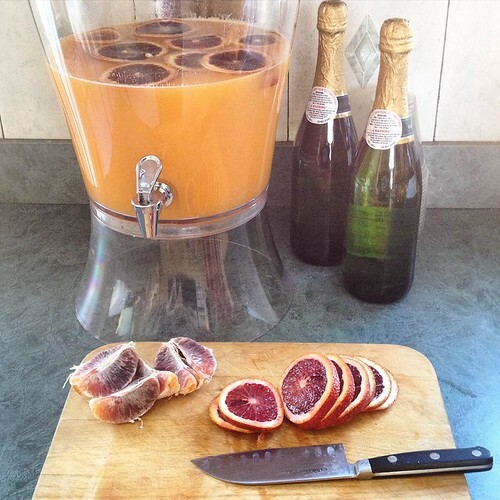 To serve, pour blood orange juice mixture into a glass and slowly top off with ice cold Prosecco.